First Appearance: My Greatest Adventure #80 (June 1963): "The Doom Patrol"
Rita Farr, the super-heroine known as "Elasti-Girl" (and sometimes "Elasti-Woman") was a famous Hollywood film star before the accident which gave her super-powers. 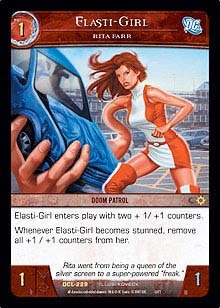 Thinking herself a "freak," Farr retreated from acting and became a founding member of the Doom Patrol, a super-team. Rita Farr has never been portrayed as overtly religious; nor has she been portrayed as irreligious. Her ethics, morality and religiosity seem fairly typical for mainstream superhero characters introduced in the early 1960s. Based on the appearance of the wedding and the minister chosen to conduct the wedding ceremony between Rita Farr and Steve Dayton ("Mento") in Doom Patrol #104 (June 1966), it is reasonable to conclude that Farr is a Protestant, at least nominally so. The minister appears to be a mainstream Protestant Christian. The minister and the wedding appear fairly generic. One can rule out some specific denominations: One can be fairly certain that the minister and wedding are NOT Eastern Orthodox, Catholic, Episcopalian, Latter-day Saint, or Jehovah's Witness, for example. This wedding doesn't really say much about Rita Farr's religiosity, other than suggest the religious affiliation she most identifies with. Although less likely, the minister and church may have even been chosen by Farr's husband-to-be, Steve Dayton. Religious affiliation was typically a taboo subject in comics during this time and overt portrayals of religiosity were rare, even with characters the writers regarded as typically religious. Rita Farr's strong ethical values and heroism, including her frequent desire to defend the weak and defenseless, may be the best indicators of her beliefs and character. Challengers of the Unknown (vol. 1) #48 (Feb.-Mar. 1966): "Twilight of the Challengers"
The Doom Patrol (vol. 1) #86 (Mar. 1964): "The World's Strangest Heroes"
The Doom Patrol (vol. 1) #86 (Mar. 1964): "The Brotherhood of Evil"
The Doom Patrol (vol. 1) #87 (May 1964): "The Terrible Secret of Negative Man"
The Doom Patrol (vol. 1) #88 (June 1964): "The Incredible Origin of the Chief"
The Doom Patrol (vol. 1) #89 (Aug. 1964): "The Animal-Vegetable-Mineral Menace"
The Doom Patrol (vol. 1) #90 (Sep. 1964): "The Enemy within the Doom Patrol"
The Doom Patrol (vol. 1) #92 (Dec. 1964): "The Sinister Secret of Dr. Tyme"
The Doom Patrol (vol. 1) #93 (Feb. 1965): "Showdown on Nightmare Road"
The Doom Patrol (vol. 1) #94 (Mar. 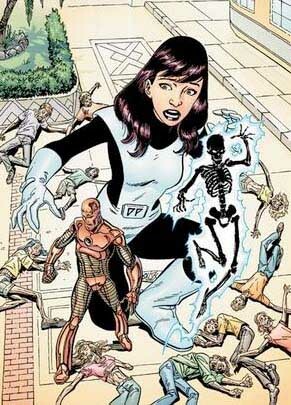 1965): "The Nightmare Fighters"
The Doom Patrol (vol. 1) #94 (Mar. 1965): "The Chief "Stands" Alone"
The Doom Patrol (vol. 1) #98 (Sep. 1965): "The Death of the Doom Patrol"
The Doom Patrol (vol. 1) #98 (Sep. 1965): "60 Sinister Seconds"
The Doom Patrol (vol. 1) #99 (Nov. 1965): "The Deadly Sting of the Bug Man"
The Doom Patrol (vol. 1) #99 (Nov. 1965): "The Beast-Boy"
The Doom Patrol (vol. 1) #100 (Dec. 1965): "The Fantastic Origin of Beast-Boy"
The Doom Patrol (vol. 1) #101 (Feb. 1966): "I, Kranus, Robot Emperor!" The Doom Patrol (vol. 1) #102 (Mar. 1966): "8 Against Eternity"
The Doom Patrol (vol. 1) #103 (May 1966): "The Meteor Man"
The Doom Patrol (vol. 1) #105 (Aug. 1966): "Honeymoon of Terror"
The Doom Patrol (vol. 1) #105 (Aug. 1966): "The Robot-Maker Must Die"
The Doom Patrol (vol. 1) #106 (Sep. 1966): "Blood Brothers!" The Doom Patrol (vol. 1) #107 (Nov. 1966): "The War Over Beast Boy"
The Doom Patrol (vol. 1) #111 (May 1967): "Neg Man's Last Road!" The Doom Patrol (vol. 1) #113 (Aug. 1967): "Who Dares to Challenge the Arsenal?" The Doom Patrol (vol. 1) #114 (Sep. 1967): "Kor the Conqueror!" The Doom Patrol (vol. 1) #115 (Nov. 1967): "The Mutant Master!" The Doom Patrol (vol. 1) #116 (Dec. 1967): "Two to Get Ready... and Three to Die!" The Doom Patrol (vol. 1) #117 (Feb. 1968): "The Black Vulture!" The Doom Patrol (vol. 1) #118 (Mar.-Apr. 1968): "Videx Monarch of Light"
The Doom Patrol (vol. 1) #119 (May-June 1968): "In the Shadow of the Great Guru"
The Doom Patrol (vol. 1) #120 (July-Aug. 1968): "The Rage of the Wrecker"
The Doom Patrol (vol. 1) #121 (Sep.-Oct. 1968): "The Beginning of the End!" The Doom Patrol (vol. 1) #122 (Feb. 1973): "The Animal-Vegetable-Mineral Menace"
The Doom Patrol (vol. 1) #123 (Mar.-Apr. 1973): "Menace of the Turnabout Heroes"
The Doom Patrol (vol. 1) #124 (June-July 1973): "The Enemy within the Doom Patrol"
My Greatest Adventure #80 (June 1963): "The Doom Patrol"
My Greatest Adventure #81 (Aug. 1963): "The Nightmare Maker"
My Greatest Adventure #83 (Nov. 1963): "The Night Negative Man Went Berserk"
My Greatest Adventure #84 (Dec. 1963): "The Return of General Immortus"
My Greatest Adventure #85 (Feb. 1964): "The Furies from 4,000 Miles Below"